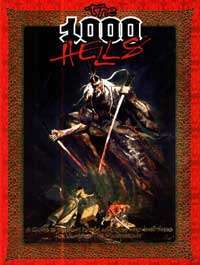 All of Asia's Kuei-jin share a common experience - the agony of torture after death in one of the Thousand Hells. Beyond pain, beyond the end of existence, their very souls are flayed for their sins in the living world. Only the most powerful escape to rise again as vampires, but not even they can forget their suffering. The domains of the Yama Kings wait beyond the Wall, where demons and their servants anticipate the coming of the Sixth Age, when the Demon Emperor shall be loosed upon the world. The Yomi Thousand Hells are nothing like the spirit worlds of the West. Spun from the stuff of nightmares and corruption, they embody the worst damnation imaginable to the human mind - and more. At last, the secrets of the Yama Kings are revealed and the gates of their domains are opened. Now the bravest (and most foolish) Kuei-jin can return to set things aright in the homelands of demons. . . or be consumed and forever lost. Descriptions of the Hells are complemented by new rules for Yomi demons and spirits. Yama Kings and the powers of their undead servants, the akuma, are finally revealed. And, at last, the Yomi's place in World of Darkness cosmology is explained.